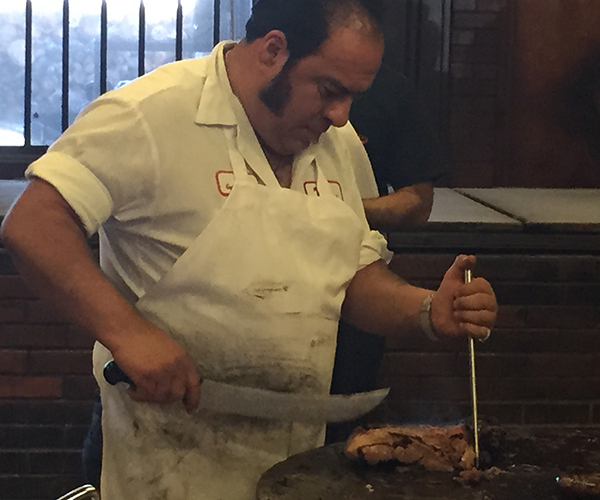 This was the big day, we were headed to the mecca of Texas BBQ, the Town known as the Capital of BBQ: Lockhart, Texas. We woke up early in the town of Round Rock with our plan set and eyes focused on the prize. We jumped on the express way and headed south (just so you know the express ways in Texas are REALLY AN EXPRESS WAY, I believe the speed limit was 85mph!). We were pulling down a country road, headed away from Austin as the scenery became more and rural, with tree lined roads and open spaces. Up ahead was the large red barn building of Kreuz Market. 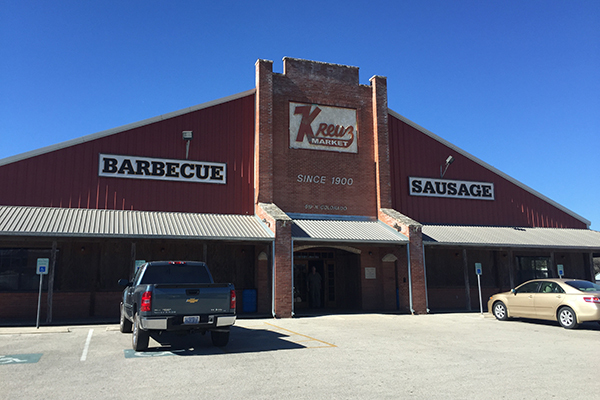 Kreuz Market is the new kid on the block as far as the structure, but the history behind the BBQ is a whole other story. You can read more of it here. We pulled in around 11:30 on a weekday—which I highly recommend—getting there early ensures you are getting the freshest meat and since it was a weekday, there were only a few people ahead of us in line. The walls are simply decorated with a few framed pictures of the town football team and then there’s the large menu. While we wait in line to enter the pit room there is a large dinning area to our right, where you purchase any sides or drinks you like. 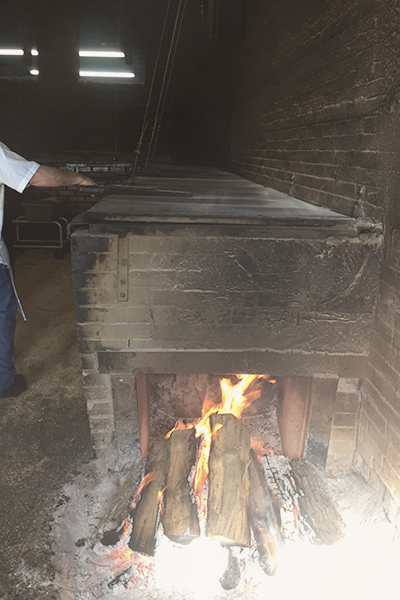 As we entered the pit room we were greeted by the friendly people at the register and then watched the pit master take the brisket and links off the smoker to fulfill our order slicing it there in front of us. 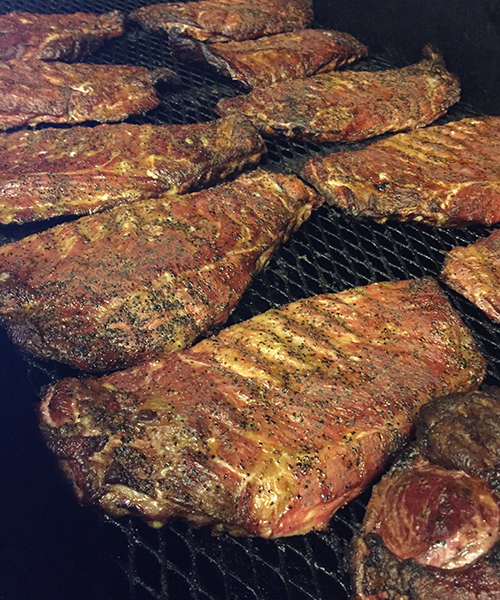 I had the pleasure of getting up close and personal with the smokers and even cutting a few slices of brisket for the customer behind us (it’s good to be a BBQer blogger). 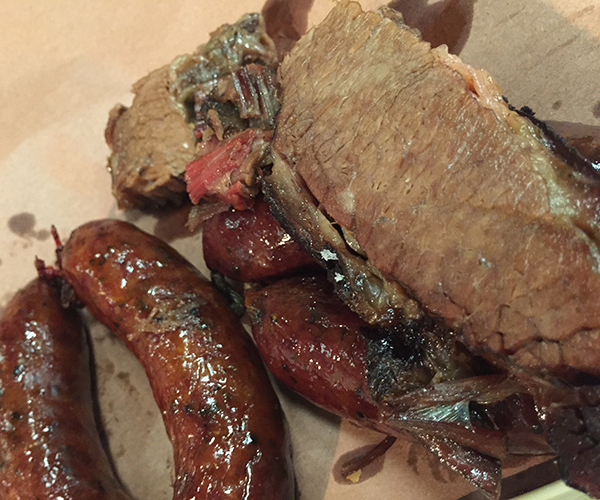 They filled our butcher paper with the brisket and sausage along with a couple slices of bread and we moved to the open dinning room to dig in. The brisket was AMAZING, perfect peppery bark, moist tender meat, and the sausage had that perfect snap and the jalapeño cheese had the perfect blend of spice… Lockhart was already living up to its reputation. We left Kruez more full than we were planning, and turned down a couple back streets leading us to our next stop: Blacks Barbecue. 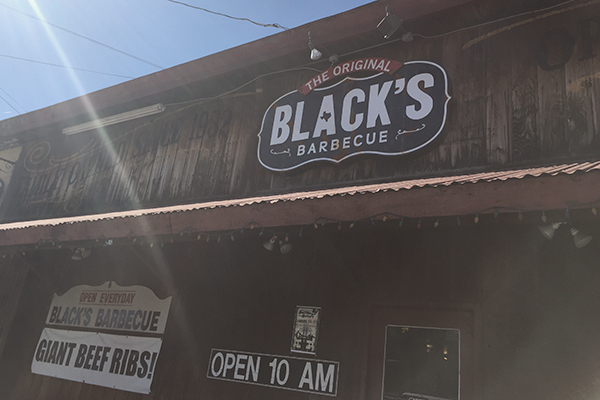 Black’s Barbecue: outside is an old wood building near the center of town, much smaller then Kreuz but you can tell it also has more history. You get the feeling not too much has changed in the last 83 years they’ve been in business. 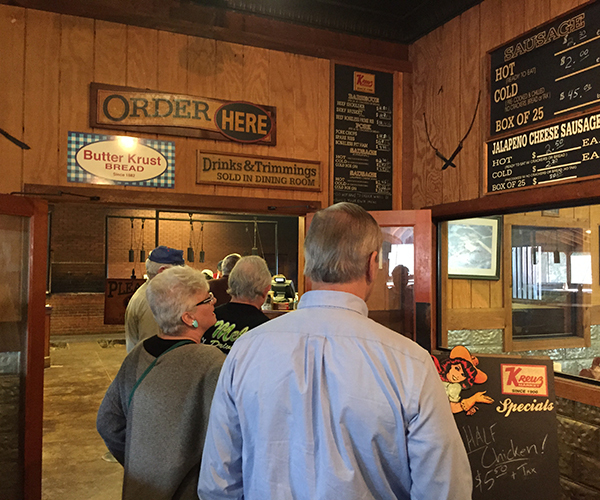 You can smell the history in the wooden walls—for anyone whose life revolves around BBQ, you feel like you’re coming home. 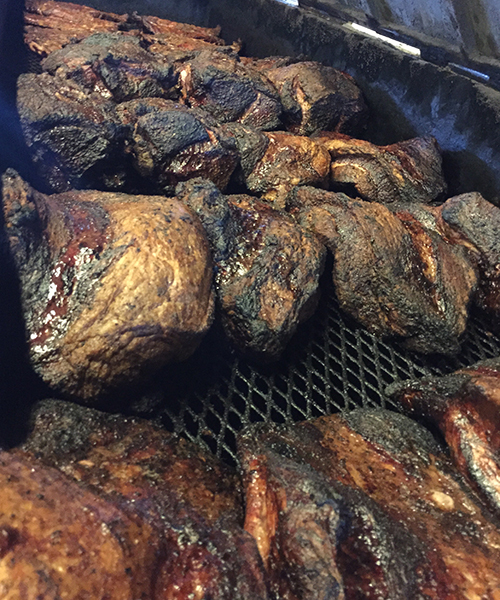 The BBQ was great, the brisket was a littler richer then Kruez and more on the fatty side. We finished what we could of the brisket and sausage and spent the next 10 min or so walking around the place, taking in the history of Lockhart on Black’s walls. So which one is better?… I can’t say at this point, if I would of had Blacks first I think I would enjoy the fattier brisket more, but being on the full side it was a little too rich. Next time I go back I will go to Black’s before Kreuz. So that’s where the great debate starts: fatty vs lean. 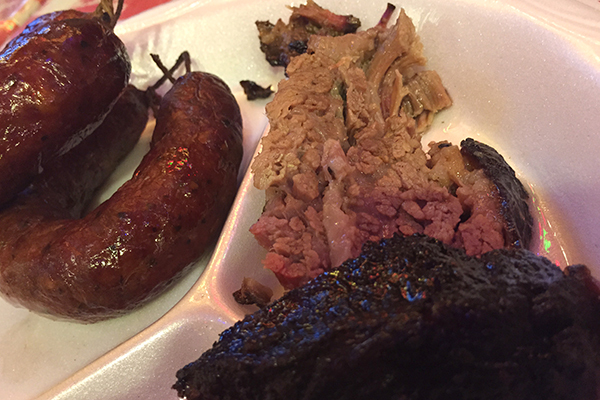 At each place we ordered lean brisket and moist brisket (flat vs point). Whats your favorite? 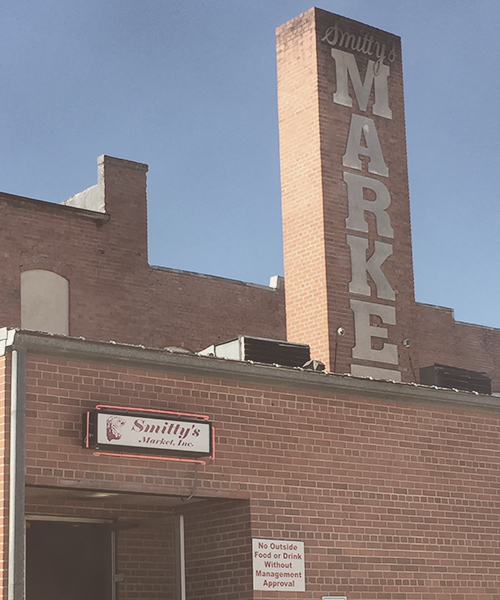 We had over did it and was kicking ourselves for not saving room for the final place in the BBQ trinity… Smitty’s Market. 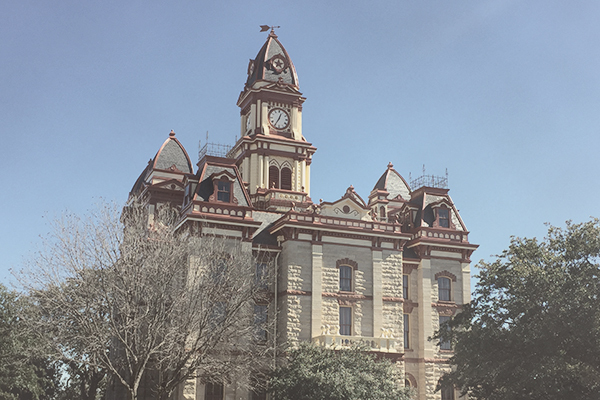 We made our way over there driving past the beautiful Lockhart courthouse. 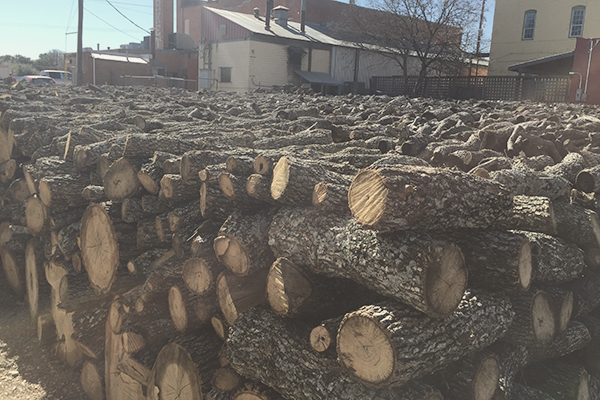 The first thing you notice at Smitty’s is the enormous lot pilled high with post oak, making our way to the back parking lot, we walked inside and nearly burning our shoes with the nearby fire on the floor right next to the doorway (which would never pass code in California). You have to respect a place who can do something right for so many years, keeping loyal to their history. 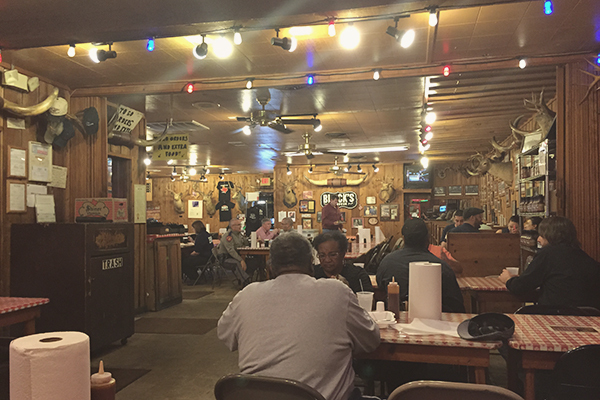 You can tell Smitty’s and Kreuz have the same spirt of BBQ between them, from the style of pit to the friendly staff. This will be our first stop when we come back. We had been so lucky with the short lines that we found ourselves leaving Lockhart before 1pm. Well, with so many hours of day light left, we headed north the sausage capital of the United States… Elgin. Stay tuned for Elgin Sausage, Louie Mueller and Rudy’s.